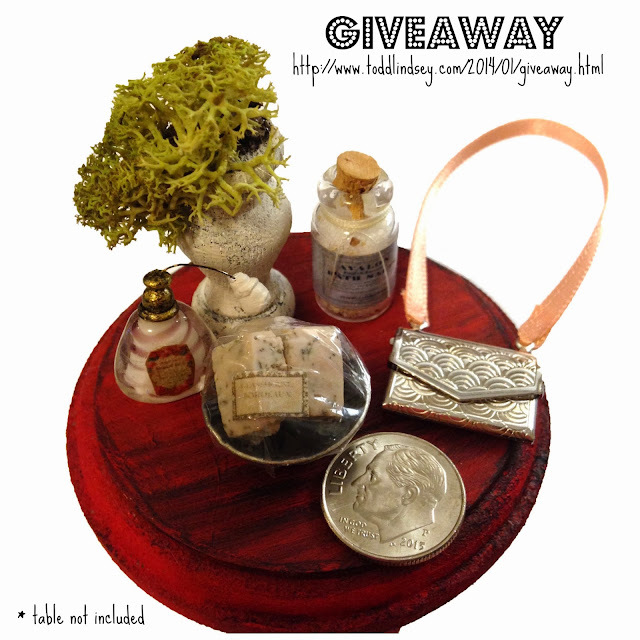 To celebrate a new year, I am going to host my very first giveaway! I am super excited and have two awesome mini prizes to give to two lucky (random!) winners. Here is the loot. First place, or the first random draw, will receive this super prize! First place comes with a lovely bath set! You get the plant (coming soon to our Etsy shop! ), perfume bottle, bath salts, opening purse and bowl of handmade soaps. The table is not included. The dime is also not included and is there for scale only. Second place, or the second name drawn, will receive this equally fun prize! 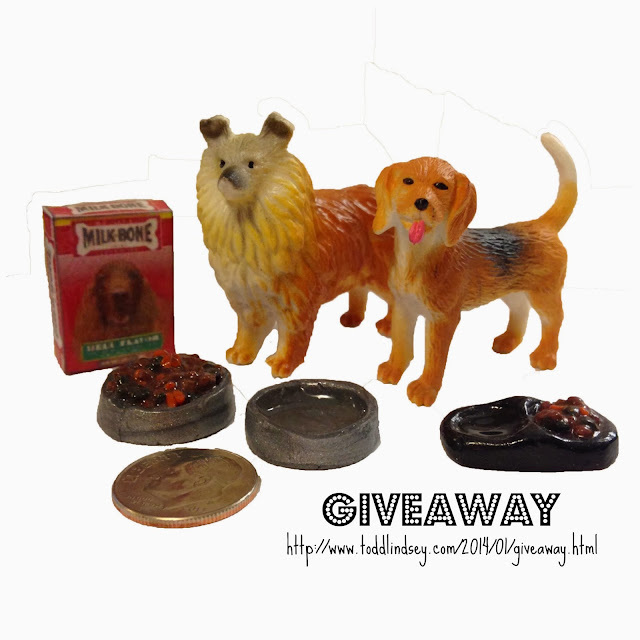 Second place comes with two puppies, box of Milk-Bones and two sets of food bowls with food and water. The dime is not included and is there for scale only. Add our Etsy store to your Favorites. A wonderful giveaway! You are already in my G+ circles, I have added you to my sidebar as a link as well. I think I will add a new Tab to the miniatures group and set up givaways ;) Yours will be first. Great giveaway! Please include me! You are already in my circles on G+. I am now following you on Pinterest & Instagram & I have added you as a favorite shop on Etsy. I will include a link to your giveaway on my blog. Hi Lindsey! I do believe I am in your Google + circle already so count me in! :D I think that I shall now start following you on Pinterest too! I love it, but I want someone who has a decorated dollhouse to have it! Oh how fun is this!!! I will have to jump on over to your etsy site friend!!!! Hope you have a great week!! What a great giveaway. the prices are beautiful. However...count me out this time as they are not period appropriate to my project...I would rather someone who can use it get it...I will however completer some of those activities. Oooh! Cool prizes! I love your soap. Good luck everybody! Great give away! Facebook: check! Hola Lindsey! ya te tengo como favorita, me gustan mucho tus trabajos, me gustaria participar en tu sorteo, te comparto en mi blog! También te sigo en Pinterest! Y tienes mi -Me gusta- en Facebook!! Added a link and photo on my blog. I would love to join your giveaway, I put a link on my blog. How do I follow your blog?. I just visited your Etsy shop and favorited your shop. It's a great giveaway! I follow on Facebook (Rosey Marie). I follow on Pinterest (mail4rosey). Subo el aviso de tu sorteo a mi blog. Thank you for having given me the link to your blog in your comment on my blog, this way I discovered your work. Your giveaway is wonderful, please count me in! Anuncio tu sorteo en la barra lateral de mi blog. Would love to be in your give-away competition. You`re already in my Google+ and Im following you on facebook and Pinterest. Hola Lindsey, me gustaría participar en tu sorteo y lo comparto en mi blog. 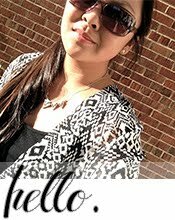 Hola Lindsey, te sigo casi en todos, me falta instagram, cuando descubra como darme de alta te seguiré, te anuncio en mi blog. Gracias.